Who doesn't love a muffin? And the cooking smells are just fabulous ... you can use fresh fruit (raspberries, diced mango, mashed banana, blueberries, apple), dried fruit (cranberries, ready-to-eat apricots, mango, pears, apple or prunes) or chopped canned fruit (pineapple, apricots, peaches or pears) for this versatile recipe. If you can’t find wheatgerm, add an extra 25g of wholemeal flour. Follow a recipe; follow food safety & hygiene rules; tidy away; crack an egg; beat an egg; divide mixture into tins; use measuring spoons and cups; use balance/digital scales; use a jug to measure liquids; chop using bridge/claw safely; use a box grater safely. Knife, chopping board, grater, weighing scales, measuring cups and spoons, measuring jug, small bowl, fork, mixing bowl, wooden spoon, ladle, muffin cases, muffin tin, skewer, oven gloves. Prepare the fruit and vegetables. Place the grated carrot into a large bowl and stir in the flour, wheatgerm, baking powder, ground cinnamon and sugar. Gradually add the milk and oil followed by the egg and mix well until evenly blended. Finally stir in the fruit. Divide the mixture into 6 muffin cases and bake in the oven for 20 minutes until a skewer inserted into the centre comes out clean. 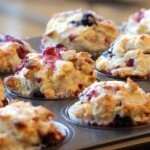 Remove the muffins from the oven using oven gloves and leave to cool slightly before serving. 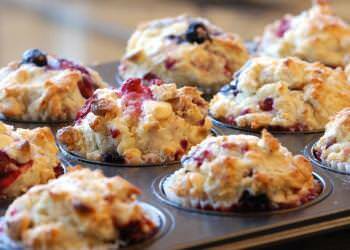 Muffins tend to be high in fat and sugar, although some are worse than others. The Eatwell guide says that if you are consuming foods and drinks high in fat, salt and sugar we should have these less often and in small amounts. Fruit are high in a variety of vitamins, minerals and fibre, and they are packed with lots of different substances called phytochemicals. 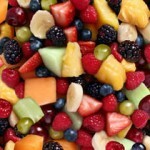 Phytochemicals can help protect our bodies against disease.